Pick the Hyundai Sonata Today! New York Autobrokers > Blog > Blog > 2018 Models > Pick the Hyundai Sonata Today! The Hyundai Sonata is an elegant, sophisticated, and exciting mid-size sedan. This vehicle is the perfect option for those seeking a family car or a mid-size sedan that will meet their daily needs. Whether you intend to use the 2018 Sonata to get yourself to work or your kids to school, this sedan is sure to please. For 2018, the Hyundai Sonata has some new exterior styling that will very likely turn heads. 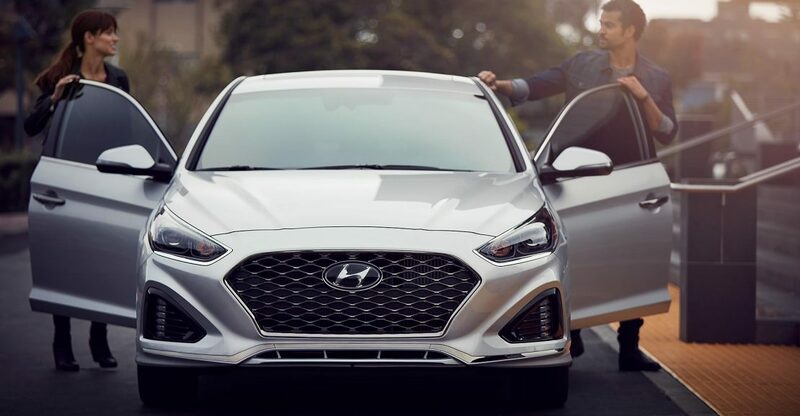 The sedan is luxurious in design, with new LED taillights, LED daytime running lights, a restyled bumper, a new trunk lid featuring the Hyundai logo, and the new Hyundai hexagonal cascading grille. This sophisticated design makes a statement and was designed to impress. Another impressive feature of the 2018 Hyundai Sonata is the 2.4-liter engine under the hood of this mid-size sedan. This engine is paired with a six-speed automatic transmission and is capable of producing 185 horsepower and 178 pound feet of torque. Feel in control when sitting in the driver’s seat of the 2018 Hyundai Sonata. Exterior looks are important, but the cabin is where you and your passengers will be spending your time. The 2018 Hyundai Sonata offers comfort and modern technology that make this vehicle relaxing and fun to ride in. The 2018 Sonata has a redesigned center stack, so you and your front seat passenger can easily use the 7-inch touchscreen infotainment system. This touchscreen comes standard with the vehicle, as well as the smartphone connectivity via Apple CarPlay and Android Auto. If the 2018 Hyundai Sonata sounds like the perfect mid-size sedan for you or for your family, you can check this Sonata out for yourself at New York Autobrokers. You can find us at 320 E Main Street in New York, or you can reach us by phone at 631-446-4455 for more information!